Managed by: A management contract between the City of Portland and the non-profit Pioneer Courthouse Square, Inc., decrees that the City Parks Department will provide landscape services to and be on call to fix any major problems at the Square, while Pioneer Courthouse Square, Inc., will be responsible for all other activities. Any physical changes to the Square must be approved by the Parks Department. The Square is not part of the downtown BID, although the BID does contract with Pioneer Courthouse Square, Inc., to provide cleaning and security for the space. Pioneer Courthouse Square, Inc., has a staff of six, as well as a 35-member board comprising community members, business leaders, and a commissioner from the Parks Department. Maintenance: The Parks Department maintains the Square's flowers and trees as an in-kind service. The rest of the cleaning is outsourced through the local BID, and costs $40,000 per year. Security and hospitality: The city provides a grant that partially funds security. Security is contracted out to the same vendor as the one used by the BID, thus creating "seamless" protection for the downtown. The "guards'" role is to enforce park rules. Programming: Pioneer Courthouse Square, Inc., provides such events as concerts and the annual Christmas Tree lighting. It operates a system of equipment rentals in which it rents (at discount) from specific vendors who know in advance which materials will be needed. It also encourages other groups to use the space for their own activities, such as the annual Festa Italiana held by the local Italian-American community. Starbucks and Powell's Travel Books are presently the only commercial vendors in the Square. Marketing and promotion: The Friends group is responsible for marketing, and has a good working relationship with the media. Since the Square is a high-traffic area, it is an ideal location for events, most of which are either fun or controversial, and make good stories for the press while generating publicity for the Square. Pioneer Courthouse Square, Inc., was marred by a $100,000 embezzlement in 1997. After this was discovered, the organization's manager, Karen Whitman, reorganized the group to emphasize a more business-like and professional approach, including regular audits and a business plan. Capital Investment:Completed in 1984, Pioneer Courthouse Square cost $6.8 million to construct. Financing was provided by the Portland Development Commission, tax increment bond funds, federal grants from the Urban Mass Transportation Administration, the Heritage Conservation and Recreation Services, the city of Portland, and an adjacent department store. 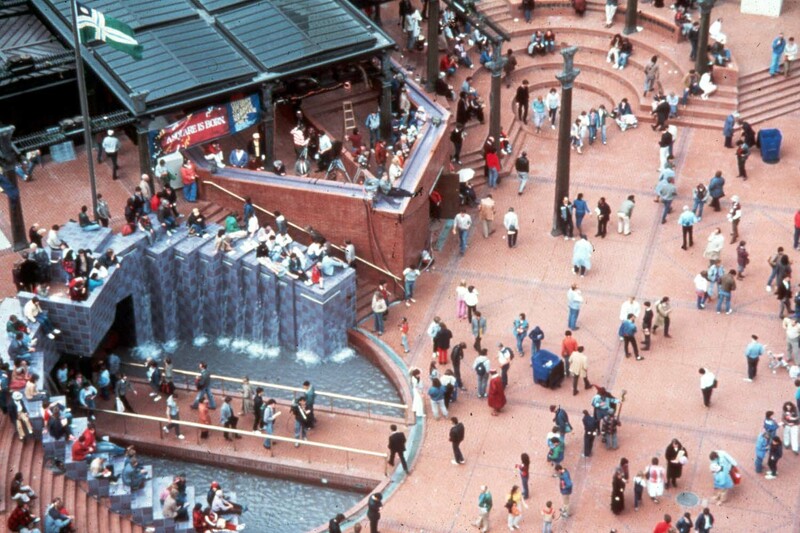 Additional funds were raised by Pioneer Courthouse Square, Inc., through auctioning off parts of the Square, including paving bricks (inscribed with the sponsors' name) such design elements as an amphitheater and drinking fountains. 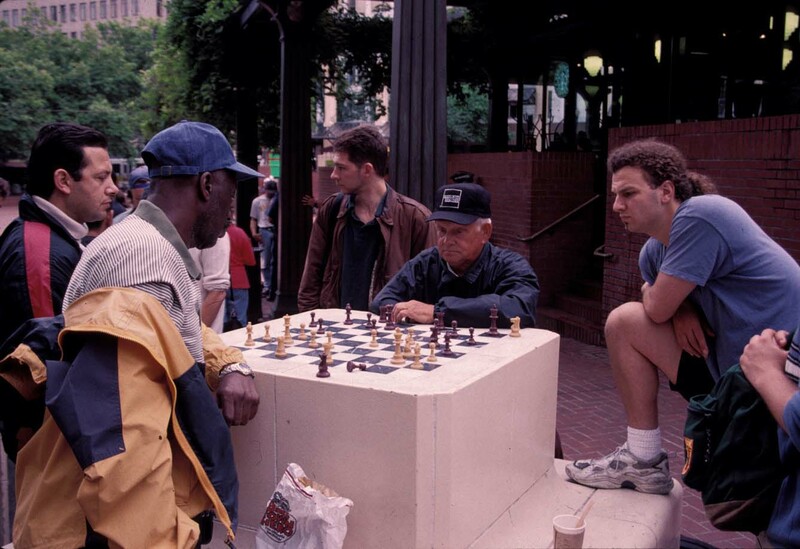 Since 1984, Pioneer Courthouse Square, Inc., has carried out two capital campaigns. In 1999, $1million was raised to repair and renovate the exterior space ; half of the budget came from Tri-Met and the City Park Bureau, while the other half came from individual and corporate sources. Starbucks completed a 160-sq.-ft. expansion of its store in connection with this renovation. In 2001, $2.7 million was raised to renovate the Square's interior lobby space to create every half-hour a free, 12-minute film, "Perfectly Portland," which concentrates on the city and its people. Major partners in the renovation included the Portland Oregon Visitor Association (POVA), Tri-Met, ticket agency "Ticket Central," and Powell's Travel Store. 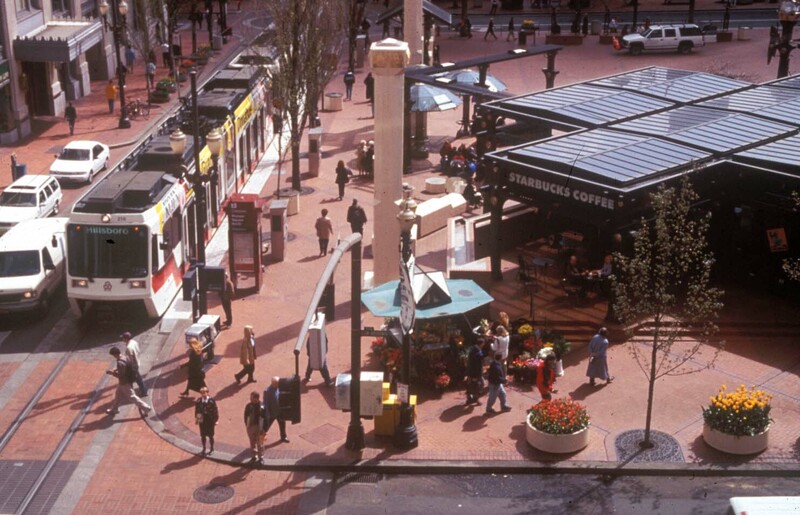 Pioneer Courthouse Square illustrates the beneficial and synergistic relationship that is possible between a public space and public transit system.